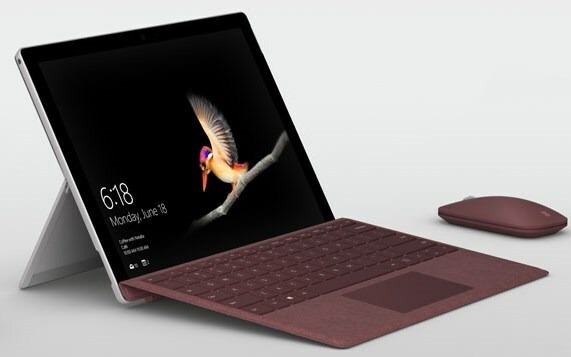 Microsoft delivers the Surface Go, a new 10-inch tablet that features the Intel Pentium Gold 4415Y processor in combination with Windows 10 in S Mode. The slate has a thickness of 8.3mm and weighs 520g. It has a 3:2 PixelSense display with a 1800 x 1200 pixel resolution and features a Windows Hello camera, USB 3.1 Type-C, a headphone port, and microSD memory card reader. Pricing starts at $399 (449EUR) for the base model, which has 4GB RAM and a 64GB SSD, and for $549 you can get a model with 8GB RAM and a 128GB SSD. If you need the keyboard, add in an extra $99 for the Type Cover, and the Surface Pen will set you back another $99. Pre-orders are open today and the first devices will ship on August 2. LTE versions will follow later this year.